I recently celebrated 3 birthdays on 3 consecutive days, one of which has some contemporary historical significance. Marshal McLuhan the flawed genius who predicted the global village & much more was born 100 years ago July 21, 1911. (The other two birthdays were mine on July 22 and my son’s on July 23). I lived in Toronto in the 1960s & 1970s and read and followed McLuhan’s work until he went into an hiatus toward the end of his life in 1980. That the world was becoming a global village through technology and much more was front & centre in his ideas. In his final years he began to act strange and he physically lost his voice to brain cancer. More recently he has become accepted again and his teachings are now well recognized. 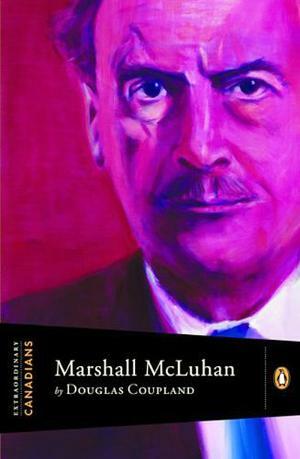 Cover of Marshall McCluhan book by Douglas Coupland Penguin Extraordinary Canadians Series 2011. Surprisingly in spite of his insight about technology he was not in favour of the way media was going. He did love his role and his insights are still remarkable. (Google Marshall McLuhan quotes for some of his insights). On a personal level I recall being in a long line in a Loblaws when a man started yelling “we need more help here” as he charged to an empty checkout. Staff came running. It was Marshall McLuhan putting on a performance. On another occasion my son was a cameraman at the CBC and filmed McLuhan while he was interviewed in the back yard of his house for an hour. I will not forget the moment in the Woody Allen film when there was an argument about McLuhan and Allen said just a minute and brought McLuhan in to the argument out of nowhere to everyone’s surprise. In 1989 and in 1997 excellent biographies of McLuhn were written. I have written about the Extraordinary Canadians Series by Penguin Books on occasion and recently picked up a new Penguin book on McLuhn by Douglas Coupland the author and artist. (www.extraordinarycanadians.com) and thoroughly enjoyed the story and the writing. Coupland was quite frank about McLuhn’s genius and his weaknesses using some language I can’t use here. I entertained my interest in history and art on my birthday when my wife and I visited the renovated Art of Ontario Gallery and saw the powerful Abstract Expressionist exhibition of works from the Museum of Modern Art in New York. My wife is an abstract expressionist painter and was influenced by some of the painters in the show. She recently had one of her abstracts placed in the permanent collection of the new North Bay Regional Health Centre. We enjoyed several of the other exhibits as well as the Impressive architecture. Well worth a visit. Speaking of art the annual Gallery Hop at 7 downtown North Bay locations is taking place on the evening of Friday August 12. The Kennedy Gallery in the Capitol Centre has 2 openings. Photographer James Forsythe’s – The Secret Garden profiles the work of children growing their own vegetables. (Gallery II). Marc Gaudreault shows photographs in Gallery I. Both have official openings from 7 – 9 pm. Art on Main has the opening of Mim Thompson’s exhibition as a part of the Gallery Hop on the same night. Check the Thursday Nugget for email addresses of other Galleries including other Gallery Hop locations – Joan Ferneyhough Gallery, Blueprints Jewelry, The Farm, the North Bay Arts Collective and the White Water Gallery.